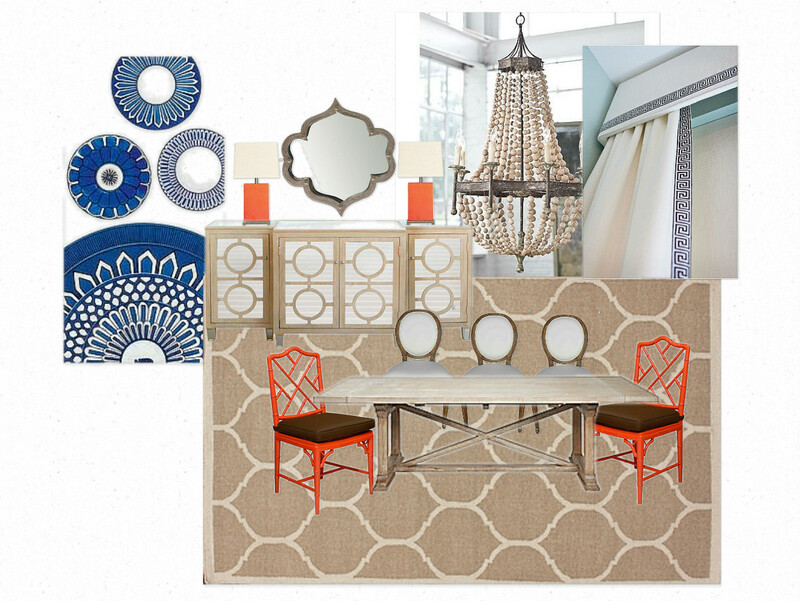 Here's a dining room design I have in progress. The clients are a young couple who love to cook, entertain, and gather many friends around their table. They have a very elegant formal dining room with lots of built-ins and architectural detail. We wanted to balance that by bringing in some more relaxed and casual elements, while still maintaining an easy elegance. The wood bead chandelier and rustic table in a "driftwood" finish help to relax the space, while the stunning Hermes blue and white china, the mirrored buffet cabinet, and the greek key detail on the linen drapes are undeniably elegant. The orange lacquer bamboo chippendale chairs and orange lamps infuse a hit of color and fun style. I'm loving the overall vibe...and I'm also considering swapping out that shapely metal mirror for a big piece of art. With the mirrored cabinet below we might have too much mirror going on there...what do you think?? Many dining rooms are used only on special occasions and can be decorated in a fanciful manner, using bold patterns or dramatic color schemes.